It’s no secret that Zac Efron is everybody’s dream man. It appears the handsome 29-year-old is a fan of Netflix’s award-winning series, Stranger Things, as he wished Millie Bobby Brown a happy birthday on Instagram. There is no doubt that Zac Efron has come a long way since his High School Musical days, and the Hollywood A-lister is all set to steam up the silver screen this May with Baywatch. He has amassed quite a loyal fan following—including Olympic gold medalist, Simone Biles—thanks to his killer acting chops, washboard abs, and brilliant blue eyes. The talented star is also one of the most-liked celebrities among his peers because of his humble, down-to-earth personality and charming demeanor. Zac Efron’s Instagram account frequently features posts with other celebrities, and the Dirty Grandpa star has nothing but kind words to say about his fellow actors. Recently, he shared a post on Instagram for the breakout star of Stranger Things, Millie Bobby Brown’s 14th birthday. 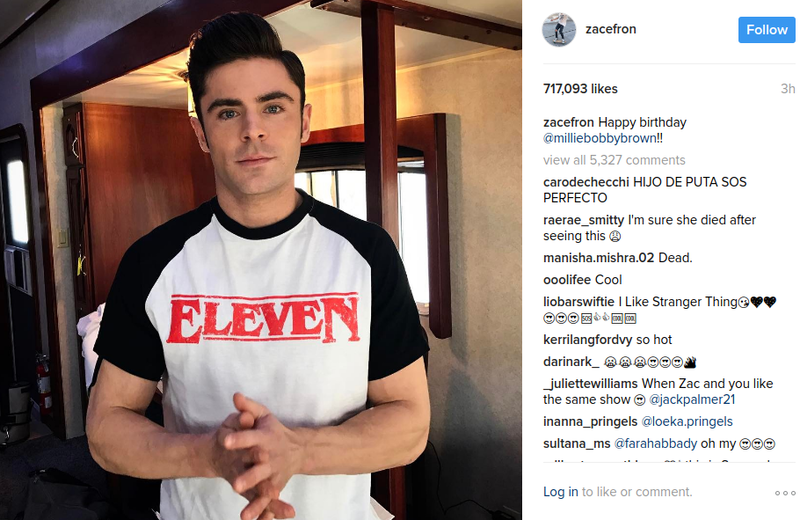 The adorable photo is simply captioned, “Happy birthday @milliebobbybrown” and showcases the star sporting a T-shirt reading “Eleven.” Check out Zac Efron’s Instagram post below. Zac Efron’s Instagram post has already racked up over 600,000 likes from his 25 million followers. For those who don’t follow Stranger Things, Eleven is the name of Millie Bobby Brown’s character in the hit series. In 2016, Stranger Things won the SAG Award for Outstanding Performance by an Ensemble in a Drama Series, and was recently renewed for its second season, which will premiere this fall. Due to her breakout performance, Brown catapulted to fame overnight and even signed a lucrative modeling contract with IMG Models. Here’s wishing the multi-talented Millie Bobby Brown a very happy birthday!